Use the sliders to graph the equations on the worksheet you were given. Be sure that the function shown on the screen matches the one on your worksheet. When you are finished graphing answer the following quesitons a) Describe the graphs when a is positive. When a is negative. b) How does the graph change when you move h? What happens when h is positive? when h is negative? 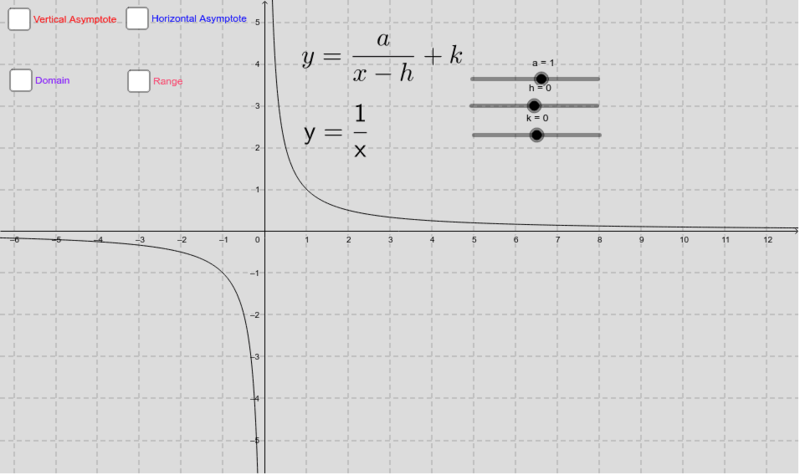 c) How would you describe the blue line (the horizontal asymptote)? How does it relate to h? d) How does the graph change when you move k? What happens when k is positive? when k is negative? e) How would you describe the red line (the vertical asymptote)? How does it relate to k?